I love Burberry. Their timeless designs are perfect for any occasion. For Fall/Winter they have created many pieces that encompass classic Burberry styles by using the always recognizable nova check pattern which has long been associated with the Burberry look. 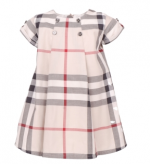 This traditional Burberry check print is found on the girl’ dresses, boy’s shirts, trousers, as well as shoes and coats for girls, boys and babies. For us, Burberry’s clothes are perfect for special occasions and because most families can’t afford the whole collection, it’s nice to have a piece or two for formal dinners, weddings or vacations.